Ashish Mhatre Associate Professor, Dept. of Kayachikitsa, D. Y. Patil School of Ayurveda, Nerul, Navi Mumbai, Maharastra, INDIA. Rambhavan Yadav Post Graduate Scholar, Dept. of Kayachikitsa, D. Y. Patil School of Ayurveda, Nerul, Navi Mumbai, Maharastra, INDIA. Rheumatoid Arthritis is a chronic autoimmune inflammatory disease that causes to pain, stiffness and swelling of the joints. It affects different parts of the body, mainly effects the joints. Amavata (Rheumatoid Arthritis) has been a challenging problem to the medical field. Various treatment protocols are applied in this disease with partial success. In present clinical study, 30 patients of clinically proven Amavata (Rheumatoid Arthritis) were treated with Erandamuladi Basti to evaluate its efficacy. Erandamuladi Basti contains Kwatha Dravyas viz. Erandamula, Rasna, Bala, Devdaru and Sahchar with other Kalka and Prakshepa Dravyas. Ayurvediya Nidanadi parameters and American Rheumatism Association guidelines for Rheumatoid Arthritis were followed. Analysis was done and results were calculated statistically using paired ‘t’ test. Results obtained are encouraging and indicate the efficacy of Erandamuladi Basti over Amavata (Rheumatoid arthritis), exploring many aspects of this clinical entity. MHATRE, Ashish; YADAV, Rambhavan. CLINICAL STUDY TO EVALUATE EFFICACY OF ERANDAMULADI BASTI IN THE MANAGEMENT OF AMAVATA W.R.T. RHEUMATOID ARTHRITIS. 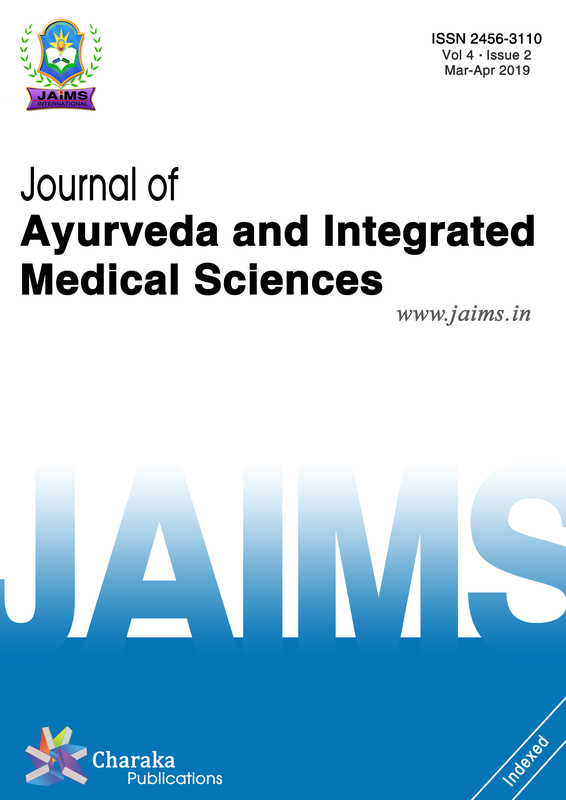 Journal of Ayurveda and Integrated Medical Sciences (ISSN 2456-3110), http://www.jaims.in/index.php/jaims/pages/view/Citation, v. 3, n. 5, p. 45 - 48, nov. 2018. ISSN 2456-3110. Available at: <https://jaims.in/index.php/jaims/article/view/669>. Date accessed: 25 apr. 2019. doi: https://doi.org/10.21760/jaims.v3i5.13818.